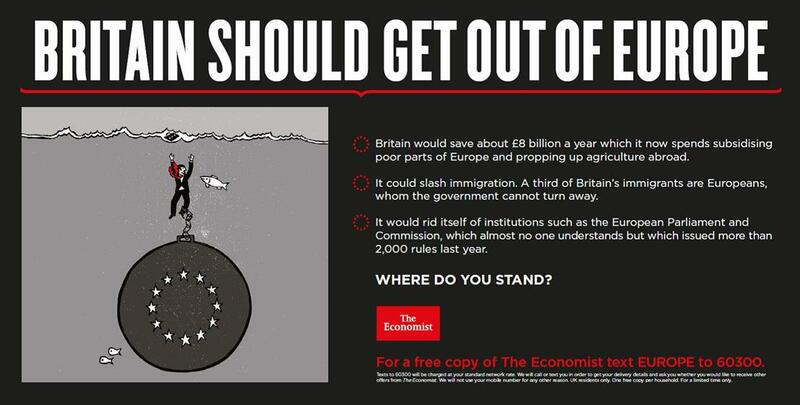 The Economist has launched the latest burst of its 'Where Do You Stand?' poster campaign across London today. The new wave of double poster ads for The Economist depict themes that have dominated – and continue to dominate – the news agenda in 2013. Ads created by Abbott Mead Vickers BBDO are running across London Underground stations include the arguments for and against Britain’s membership of the European Union, fracking as an energy solution, and the use of electronic surveillance by governments around the world. The ads will run for two weeks and entice potential readers with a free copy of The Economist through a text code. Media planning and buying has been handled by PHD. 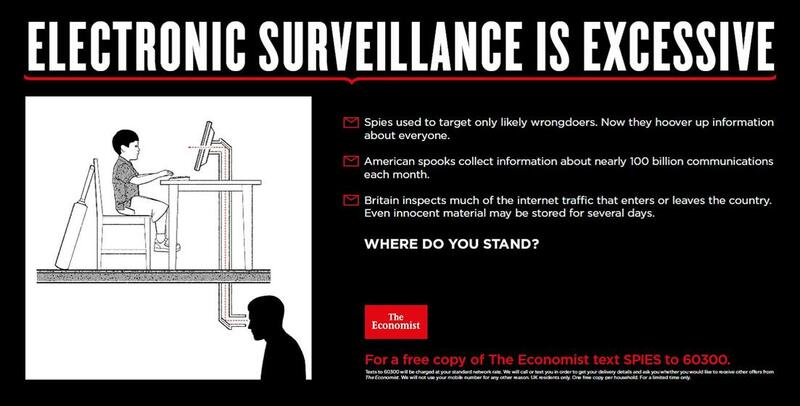 To run alongside the ads, The Economist will be hosting a discussion on Twitter on the topic of electronic surveillance, taking place on 8th November at 4pm. Susan Clark, chief marketing officer of The Economist, said: "We want to bring these issues to the fore to encourage people to think and take a stance. In true Economist style, the ads offer a balanced set of arguments that challenge existing viewpoints and stimulate debate." Leaks from former US intelligence analyst Edward Snowden continue to fuel the debate on electronic surveillance. France recently accused the US of spying on phone calls, whilst German Chancellor Angela Merkel has requested an explanation from US president Barack Obama over claims her phone had been tapped. The posters debate the role of electronic surveillance in helping to counter terrorism but also raise the question about whether it interferes with our rights to privacy. David Cameron’s Conservative Party continues to deliberate over a possible referendum on Europe as public opinion polls show significant support for a European Union exit. The posters raise questions on the impact of an exit on businesses, Britain’s international clout, immigration, and subsidising poorer parts of Europe. This summer saw 2,000 protestors demonstrating at a fracking site in West Sussex, England. The debate on whether fracking is a good or bad solution to the world’s energy problems rages on with politicians, charities and celebrities wading into the discussion. The posters raise questions about Britain’s reliance on fuel from abroad, the impact of fracking on the environment and the safety implications of fracking sites.